Richard Jochum’s Crossword Project and Thirty-Two Angry Dogs, two large-scale media installations, will be on display as part of the New York Electronic Arts Festival 2017 in DUMBO, Brooklyn from June 1 – 30, 2017. 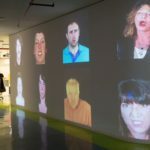 The New York-based media artist’s video projections will feature an interactive crowd-sourced crossword puzzle shown on a video wall consisting of 27 connected video monitors, and the video recordings of 32 performers silently barking projected in 360 onto the theater wall. The exhibition is a collaboration between Harvestworks, New York, and Made in NY Media Center by IFP. Richard Jochum’s Crossword Project and Thirty-Two Angry Dogs, two large-scale media installations, will be on display as part of the New York Electronic Arts Festival 2017 in DUMBO, Brooklyn from June 1 – 30, 2017. The New York-based media artist’s video projections will feature an interactive crowd-sourced crossword puzzle shown on a video wall consisting of 27 connected video monitors, and the video recordings of 32 performers silently barking projected in 360 onto the theater wall. The exhibition is a collaboration between Harvestworks, New York, and Made in NY Mediacenter by IFP. Crossword Project is a dynamically rendered, interactive crossword animation projecting crowd-sourced questions that change every few seconds. Viewers may submit questions through a webform (crosswordproject.tumblr.com) or Twitter feed (#crosswordproject). 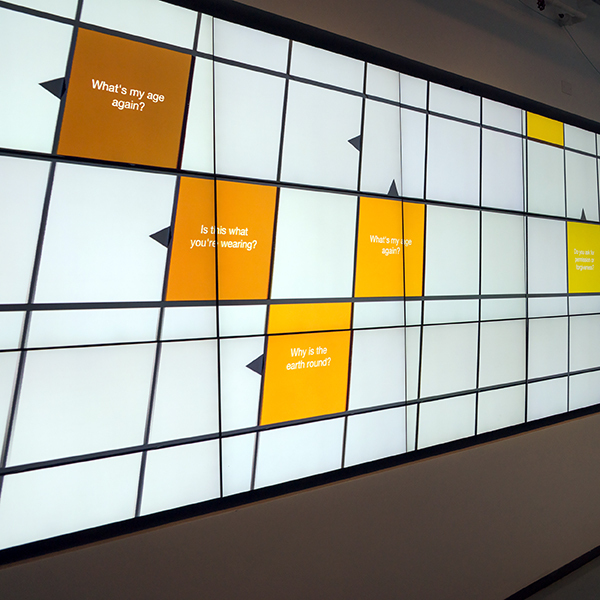 Questions are fed to a database and channeled to the video screen in real-time allowing viewers to see their questions manifest before them. This work explores participatory work as a means of public discourse. Thirty-Two Angry Dogs is based on the Twenty Angry Dogs series in which performers have been invited to bark like angry dogs in front of a camera. The silenced barking emphasizes the helplessness of not being heard while expressing raw anger. The project has been shown at Gallery Bundo in South-Korea and at the Kuenstlerhaus Thurn&Thaxis in Austria. Richard Jochum is a media artist with a strong focus on video, video installation, performance and conceptual photography. He has shown his work in more than 130 exhibitions worldwide and is represented by Gallery Bundo in South-Korea and Gallery Lindner in Austria. He is a studio member of the Elizabeth Foundation for the Arts in New York and has been a Creative Resident in the Harvestworks Technology, Engineering, Art and Music T.E.A.M. Lab 2016. An associate professor at Teachers College, Columbia University, he oversees the new Creative Technologies Curriculum as part of the Art and Art Education Program. More information can be found at http://richardjochum.net. « [June 1] What’s Up with the Scene? Connecting Art with Electronics.